← 46 "Maggie in Peril (Chapter One)"
Maggie in Peril (The Thrilling Conclusion) is the forty-seventh Simpsons short. It aired on The Tracey Ullman Show on May 7, 1989. Bart tells some important details of the previous short as it had ended abruptly. Bart and Lisa were reading while Homer ordered them to look after Maggie before he and Marge left for shopping. Although Bart does not tell what happened to Maggie as he, along with the rest of the family, were unaware of her situation and the story continues. Maggie plunges down the waterfall and emerging out fine from it. The skateboard goes up a rock like a ramp, having her in the air and landing on a small cliff. She heads through a circus and has a bunch of balloons in her hand. Marge squints on a view of Maggie from the car although she cannot recognize her and Homer squints on Marge in disbelief. 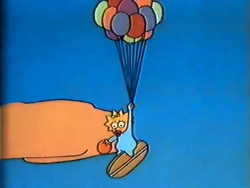 Maggie then lets go of a balloon one at a time to levitate lower before letting go the remaining balloons and rolling down the house's roof and going back down to her crib by a tree's branch and the skateboard landing back to Bart and Lisa. The family then check on Maggie, with Bart and Lisa noticing the skateboard landed, seeing her playing the ball, both which are relieved. Modified on March 16, 2014, at 06:54.